A tantra retreat for couples and singles. WARM WELCOME to Tantric Summer Retreat 2019, our third in Skeppsudden. 5 days of delightful and life-enriching journey into the world of Tantra. A unique opportunity to share, discover and deepen yourself into new insights and experiences. Our retreat is guided by Aurora & Sahajananda and few guest teachers in the amazing countryside facilities of Skeppsudden. The tantric theme of this year’s retreat is POLARITY: Discover The Fascinating Play Between Masculine & Feminine – A tantra retreat for couples and singles. Tantra is all about awakening. Awakening to life and to the beauty around us, awakening the senses and to the countless facets of joy and superior pleasures, awakening our consciousness in a dauntless lucid abandonment into any opportunity life is offering us, awakening to ourselves and to each other in natural heart presence. 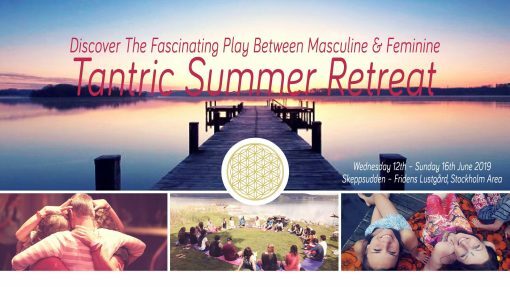 Throughout the retreat there will be space to eat, enjoy and laugh together; space to create trust, intimacy and romantic connections; and there will be guidance into beautiful meetings & insights into the tantric teachings. The tantric theme of this year’s retreat is POLARITY: Discover The Fascinating Play Between Masculine & Feminine – A tantra retreat for couples and singles. In this retreat, we aim to create a perfect blend of holiday & transformative heart work. Thus Skeppsudden Awakening Experience is offering you a chance to share knowledge, to open up to the new, to embrace the old, to courageously meet life-transformations, to explore sensuality in the light of full awareness and to surrender to love´s breath-taking gifts of connecting to others and to your inner source of happiness. By consciously engaging in the perpetual forces of life, you will have the chance to enter the common energetic field of the community, which we will create together. It will allow you to engage in a playful and spontaneous way in the activities of the retreat, to open up to your inner resources and enhance your vital, sensual and energetic experience, as well as your subtle awareness and feeling of yourself. ♥ Should I bring my partner? Can I go alone? The retreat is designed for both singles & couples. The entire program and all its activities are guided so you will meet and mingle with all the other participants. We aim to have an approximately equal number of each gender to create the optimal experience for everybody. You can come as a single or as a couple. As long as you are open to participating in the activities you will have a great time. All exercises are invitations and of course, nobody has to do anything they don’t feel to do. Everybody is setting their own inner and outer boundaries, which will be mutually respected. There might be activities during the retreat, which suggest intimacy, but these are in the same way optional and according to your personal inclinations. This event will be kept in a safe and harmonious environment. Once again, a WARM WELCOME to our Tantric Summer Life Retreat and an open invitation for 5 days of spiritual holiday & heart work in a natural and relaxed unfolding of life’s essence and fullness. We look forward to sharing and awakening with you. • The program of the retreat begins around 18.00 on Wednesday and ends around 16.00 on Sunday 16th June. • The program will contain morning, afternoon and evening sessions and include time for resting, individual practice, walks in nature, bathing, using the sauna and enjoying the wonderful togetherness around the meals. • ACCOMMODATION & FOOD: 2500 kr. is paid CASH directly to Skeppsuddens Kursgård at arrival for food and accommodation. • The retreat fee is transferred to Natha Yogacenter via swish 1233397171 or bankgiro 785-7162. It has to be CLEARLY MARKED WITH “SKEPPSUDDEN + YOUR NAME + YOUR EMAIL” as your final confirmation for your participation. Afterwards, you will receive a WELCOME LETTER which is also your confirmation, that we registered your payment. • As we have LIMITED PLACES available, please make your payment as soon as possible to secure your place. Access is based on first appearances of the payments. • Cancellation policy: After the payment has been done we will refund 75 % of the fee until 1 month before the event after that refund is not possible. • Your stay includes nice fresh-made vegetarian food (3 meals/day) and accommodation in cosy shared sleeping rooms in Skeppsudden. For accommodation in a single room with double bed there is an additional fee. You may get an invoice if you want. • Please contact Skeppsudden directly if you have any special requirements concerning accommodation or food. If for example, you want to secure yourself in a single room or a double room for you and your lover/spouse, or if you have food preferences for gluten-free, vegan or other wishes. When you sign up we will also forward you the info letter from Skeppsudden where you get more detailed information and contact to make special requests. You are also very welcome to stay one day before and after the event just to enjoy the beautiful nature there. • On the website of Skeppsudden, you find all relevant information about getting there: http://www.skeppsudden.com/hitta-hit.html Please note that you will get picked up at the local station if you choose to go by public transport. The body is a temple offering us an enormous potential of energetic experiences. We can explore it consciously through a great variety of touch, energy games, sensorial experiences or just a simple lucid awareness upon the breathing. There are infinite ways to awaken through tantra when first you know the basic methodology. It is kind of inborn in us and many today even call it ‘human technology’. At the heart of any spiritual celebration is always the spirit.It is the spiritual heart connection, which truly makes us feel connected. The body, its senses and magnificent aliveness of vibrant energies are offering us a great variety of possibilities to connect with each other and with ourselves, to offer pleasure to each other and experience pleasure in our own being, to offer loving presence and to experience love. Our Summer Retreat is an experience happening simultaneously inside and outside ourselves.